An artist's illustration of 'Oumuamua, the first interstellar object ever to be discovered passing through our solar system. Leonid Solovyev is Director of Operations for The Breakthrough Prize Foundation, dedicated to advancing understanding of the universe at the deepest levels. Its Breakthrough Prizes honor important achievements in Fundamental Physics, Life Sciences and Mathematics and are sponsored by Sergey Brin, Pony Ma, Julia & Yuri Milner, Anne Wojcicki, Priscilla Chan & Mark Zuckerberg. Solovyev contributed this article to Space.com's Expert Voices: Op-Ed & Insights. 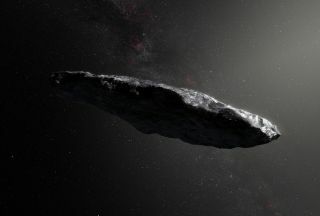 Hold the front page: the interstellar visitor recently discovered in the solar system is almost certainly not an alien spacecraft. This caught the attention of Breakthrough Listen, the radio astronomy program of Breakthrough Prize Foundation, which uses some of the world's biggest telescopes to search for evidence of intelligent life beyond Earth. Scientists quickly turned the Green Bank Telescope, the largest fully steerable instrument in the world, toward 'Oumuamua. At that range, Breakthrough Listen would have been able to detect an onboard transmitter with about the power of an iPhone. The observations did not reveal any signal — but they did lead to headlines like, "Astronomers Check 'Alien' Asteroid Thing For Actual Aliens". Such headlines may make scientists cringe. But ultimately, I believe, they're a good thing. Any publicity is good publicity if it gets more people engaged with the golden age of space exploration that we are currently living through. In the last two decades, among other momentous findings, astronomers have discovered that the expansion of the universe is accelerating; they have imaged its state soon after the Big Bang; and they have detected gravitational waves from black holes and neutron stars. Meanwhile, private space programs, such as Elon Musk's SpaceX and Jeff Bezos' Blue Origin programs, have re-ignited enthusiasm about human space travel. In the same period, astrobiology — the study of life in the universe — has blossomed as a science. At our annual conference on the subject, called Breakthrough Discuss, I see astronomers, cosmologists, biologists, geneticists, chemists and engineers bubbling with new ideas, from identifying exoplanet atmospheres to building synthetic life in the lab to searching for laser signals from other star systems. What has galvanized the science community around the search for life? Recent space missions, such as NASA's Kepler and Cassini missions, have changed the game, revealing that most stars have planetary systems, and icy outer moons in our solar system could hold the conditions for primitive life. And just last month, the European Space Agency's Mars Express orbiter discovered a lake of liquid water beneath the surface of Mars. If, as many astrobiologists suspect, life was once present on the Red Planet, perhaps such lakes could still support it today. One reason for this is that you never know what a scientific idea will reveal until you test it. Our program, for instance, was set up to look for "technosignatures" of advanced civilizations; we may or may not find them, but in the process we have already made astronomical discoveries in their own right — such as a new fast radio burst (FRB), one of the mysterious super-high-energy events of unknown origin. And any new knowledge gleaned about the cosmos could teach us something about its possibilities for life. In June, astronomers at the European Space Agency showed that 'Oumuamua is accelerating away from the sun more rapidly than can be explained by the force of gravity alone. Their analysis concluded that the effect is caused by "outgassing" — material being boiled off its surface — meaning that the object is probably a comet. A comet is a very different proposition than a spacecraft, yet it is still relevant to the search for life: the discovery of an interstellar comet provides renewed motivation to consider theories like panspermia, which postulates that life is transported between the stars by comets, asteroids and other voyagers. The universe is still full of mystery. We should welcome all scientifically grounded ideas that could shine a light upon it.